We have to consider that when we declare from our heart that "there is no god (deity) worthy to be worshipped but Allah", it implies on our part love, devotion, faith and obedience to the rules of Islaamic legislations which are legally binding on all Muslims. All praise be to Allah, the Lord of the universe. May peace and blessings of Allaa be upon Muhammad, His last messenger. The purpose of this hand out is to correct a false idea spread among those willing to adopt Islam as their faith. Some people have a wrong notion that entering into the Islamic fold requires an announcement from the concerned person in the presence of high ranking scholars or reporting this act to courts of justice or other authorities. It is also thought that the act of accepting Islaam, should, as a condition, have a certificate issued by the authorities, as evidence to that effect. We wish to clarify that the whole matter is very easy and that none of these conditions or obligations are required. For Allah, Almighty, is above all comprehension and knows well the secrets of all hearts. Nevertheless, those who are going to adopt Islam as their religion are advised to register themselves as Muslims with the concerned governmental agency, as this procedure may facilitate for them many matters including the possibility of performing Hajj (Pilgrimage to the Holy City of Makkah) and ‘Umrah (lesser pilgrimage). 5. Performing Hajj (a pilgrimage to the Ka’bah (sacred house built by Aadam and rebuilt by Ibraaheem) in Makkah, at least once in a lifetime for the person who is able to). "ASH-HADU ANLA ILAAHA ILL-ALLAAH WA ASH-HADU ANNA MUHAMMADAN RASOOL-ALLAAH". What would be next after declaring oneself a Muslim? One should then know the real concept underlying this testimony which means the Oneness of Allaah and meet its requirements. One must behave accordingly, applying this true faith to every thing one speaks or does. 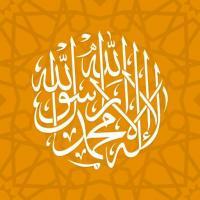 What do the words of the "Shahada" signify? The significant point which every Muslim must know very well is the truth that there is no God (deity) to be worshipped other than Allah. He - glory be to Him - is the only true God, Who alone deserves to be worshipped, since He is the Giver of life and Sustainer and Nourisher of mankind and all creation with His unlimited bounties. Man must worship Allah, Who alone is worthy of worship. The second part of the Shahaadah (i.e., Wa ash-hadu anna Muhammadan rasool-Allaah) means that Prophet Muhammad (sallallaahu ‘alayhi was sallam - peace be upon him) is the servant and chosen messenger of Allah. No one must have two opinions about this matter. In fact the Muslim has to obey the commands of the Prophet (sallallaahu ‘alayhi was sallam - peace be upon him), to believe him in what he has said, to practice his teachings, to avoid what he has forbidden, and to worship Allah alone according to the message revealed to him, for all the teachings of the Prophet were in fact revelations and inspirations conveyed to him by Allah. It simply means rendering sincere service, showing reverence for Allah. In a deeper shade of meaning, it implies total submission and complete obedience to Allaah's commandments both in utterances and actions of man whether explicit or implicit. Visible worship includes acts such as uttering the two parts of the "Shahaadah", performing prayers, giving Zakaah (the poor-due), recitation of the Qur‘an, supplication, adoring Allah by praising Him, purifying our bodies before prayers, etc. This type of worship is associated with movement of the parts of the human body. Invisible worship is to believe in Allah, in the Day of Judgement (in the Hereafter), in the Angels, in the Books of Allah, in the Prophets of Allaah, in the Divine Decree of destiny (that good and bad are determined by Allaah alone). This type of worship does not involve movement of parts of the body but it surely has bearing on one's heart which subsequently affects one's way of life. It should be bore in mind that any worship not dedicated to Allah alone will be rejected as one form of polytheism and this causes apostasy from the Islamic fold (for the one who believes that worshipping someone besides Allaah is good and correct, the one who may have done this by mistake should immediately repent and seek Allaah's forgiveness). "...whoever rejects evil and believes in Allaah hath grasped the most trustworthy Hand-hold, that never breaks..." (Qur‘aan 2:256). We have to consider that when we declare from our heart that "there is no god (deity) worthy to be worshipped but Allah", it implies on our part love, devotion, faith and obedience to the rules of Islaamic legislations which are legally binding on all Muslims. It is a requirement of "there is no god worthy to be worshipped but Allaah" to love for the sake of Allaah and to reject for the sake of Allaah. We conclude with a humble prayer to Allaah that may He cleanse the hearts and souls of those who are genuine seekers of truth and may He bless the community of believers. Aameen.